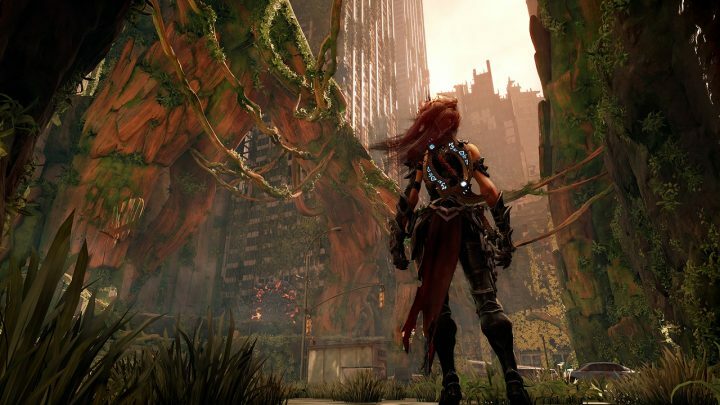 Hidden in the hellish, apocalyptic world of Darksiders 3 you’ll find a few scattered humans to rescue. These rare collectibles are usually located in secret areas, or far off the beaten path — you’ll only find a couple while completing the story’s main pathways. Find all 20, and you’ll earn the ‘Humanitarian’ achievement / trophy, along with a bunch more. These humans are located in some of the most secret areas, so you’ll also find plenty of loot while exploring. You’ll need to backtrack to find most of these lost human souls. They’re locked obstacles you probably won’t be able to overcome on your first visit. As you progress, you’ll unlock special Hollow powers — breaking through barriers, jumping higher, turning into a Metroid-style spiderball, hovering, and more. Once you unlock these powers, you’ll be able to travel back to previous zones and access new secret areas. And some of these areas are guarded by mini-bosses with big rewards. Collect all 20 humans to unlock the ‘Humanitarian’ achievement / trophy. Human #1: Maker’s Forge – At the Forge, from the Serpent Hole, go up the walkway to the right and follow the catwalks. Swing across the gap, then follow the linear path to the human. Human #2: Crossroads – From the Serpent Hole, go to the back-right of the courtyard and smash through the cracked wall with the Force Hollow. Human #3: Crossroads – Find the wrecked bus down the street, then drop into the hole. In the Subway below, there’s a human right nearby. Human #4: Skyscraper – On the long trunk pathway to the end of the area, turn right onto the skyscraper balcony and use the Storm Hollow on the gust of wind. Human #5: North End – Straight ahead, look on the right side for another cracked door barrier wall. Smash it open with the Force Hollow power — or use the nearby explosive bugs. Human #6: North End – Ahead of the previous human, continue toward the church in the distance and drop down into the lower street. There’s a hole you can crawl into. Human #7: Splintered Station – Go into the caverns from the underground (first right) and then go the opposite path from the first red blob. There’s a hole you can crawl into. Human #8: Cistern – Next to the teleport, go up the stairs. Human #9: Tangled Grotto – In the undergrowth, go straight ahead and veer left and around the corner to the wrecked train car. Use the ramp train car to go up and crawl through the opening. Human #10: Tangled Grotto – Go to the large set of stairs straight ahead from the Serpent Hole and break through the barrier with the Force Hollow. Jump up (Flame Hollow) to the right to find a hole — crawl inside and drop down the right hole to find the human. Human #11: Tangled Grotto – Return to the hole you dropped down for the previous human, and go right from there. Follow the right path up, and use Flame Hollow to leap up. Jump up twice to reach the human. Human #12: Festering Pool – At the massive building in this area, you’ll need to blow open a big purple wall. Near this wall, there is a stack of containers down a narrow passage. Jump on the containers to find the human. Human #13: The Drowning District – Enter the cavern and go through the shortcut barrier and take the stairs up to a swing point. Instead of swinging straight, swing slightly right and use the Flame Hollow to clear the gunk blocking the door. Human #14: Mangled Freeway – You can’t miss him. After crawling through the vents, you’ll exit and hear the human directly left. Human #15: Cargo Hold – Return to the Lust boss arena and use the Force Hollow on the rocky wall. Magnetize and roll, following the rock path. Continue on until you find a poison lake. Use the Wind Hollow to zip across the gust. Find the squid high up above and push it down to the far left to access a secret human. Human #16: Forgotten Lake – Unlock the red doorway in the story (across the lake) and you’ll find another hole that drops into an underwater section. Swim down and push the stones to create a path up. At the purple wall that you can break with the Force Hollow, use the Fire Hollow to the left. Use Fire Hollow again to enter the building and find a hidden human. Human #17: Sunken Tracks – Near the Serpent Hole, use the Stasis Hollow to wall-jump up, then swap to the Force Hollow to swing across the grapple point and then magnetize onto the rock ceiling. Roll across to find the human. Human #18: Sewage Egress – Right next to the Serpent Hole, Stasis Hollow jump up the shaft and then smash the breakables blocking the open doorway nearby. There’s a human in the small room. Human #19: Drilling Annex – Go outside to the large open courtyard and use Stasis Hollow to jump up. Cross the bridge and use it again. Human #20: Go to the conveyor belts and use Stasis to freeze them. Reach the conveyor to the right, then Stasis Jump up. When you’re level with the moving platforms, jump on one and ride it all the way to the end of its path. Drop down at the very end. Use Stasis Hollow on the grinders. The last human is down here.